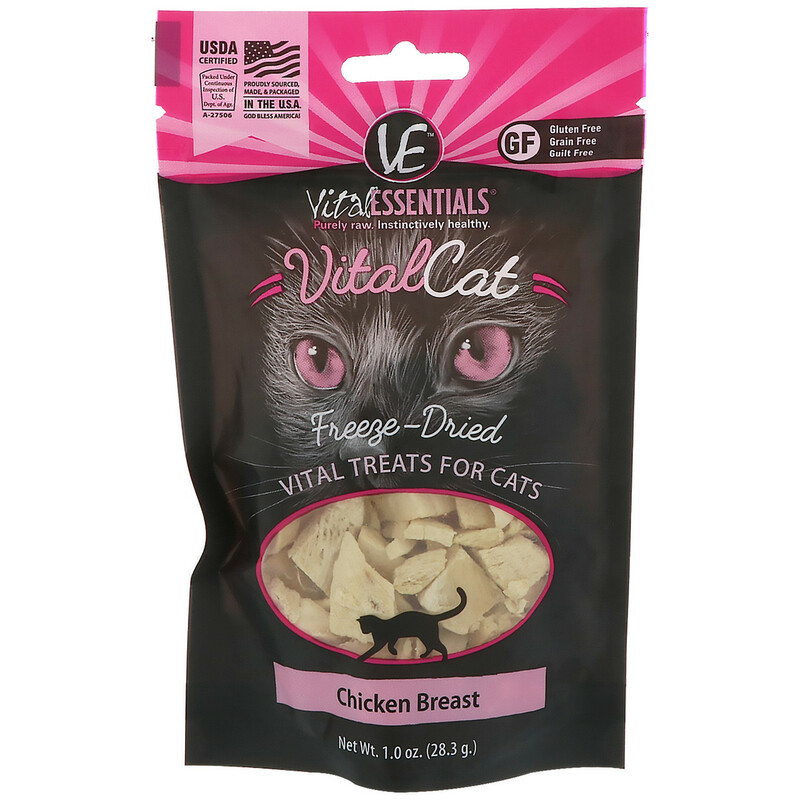 VE Freeze-Dried Vital Treats are packed with vital nutrients, made with only fresh, whole, single-sourced USDA animal protein to provide essential nutrition that cats instinctively crave. Promotes Digestive Health - Bioavailability of naturally occurring active nutrients and enzymes. Promotes Oral Heath - Natural scrubbing for clean, white teeth, healthy gums, and fresh breath. Supports Overall Health - Strong bones, firm muscle tone, glossy coats, and optimal weight. We start with fresh, high quality, RAW USDA meats, bones, and whole organs. We never add hormones, antibiotics, preservatives, or anything artificial. Our exclusive 48 hour "slow" freeze-drying process locks in vital nutrients without cooking the RAW meat and retains all the active nutritional elements. This allows the food to be safely stored without refrigeration making VE Freeze-Dried products ideal for traveling, training, snacking, and everyday meals. Без костей, без кожи куриная грудка. Vital Essentials Chicken Breast is designed as a treat and is not intended to be fed as a complete and balanced diet. Best if fed within 30 days after opening.